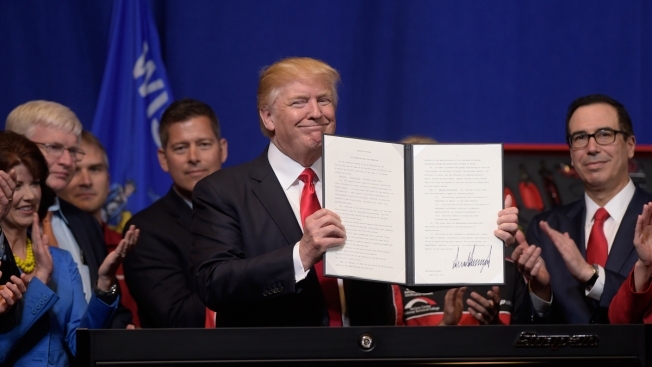 In this April 18, 2017, file photo, President Donald Trump holds up the "Buy American, Hire American" executive order which he signed during a visit to the headquarters of tool manufacturer Snap-on Inc. in Kenosha, Wis. Immigrants with specialized skills are being denied work visas or seeing applications get caught up in lengthy bureaucratic tangles under federal changes that some consider a contradiction to President Donald Trump's promise of a continued pathway to the U.S. for the most talented foreigners. Though getting what's known as an H-1B visa has never been a sure thing, immigration attorneys and employers who hire such workers say they've seen unprecedented disruptions in the approval process since Trump took office in 2017. "You see all these arguments that we want the best and the brightest coming here," said John Goslow, an immigration attorney in Ann Arbor, Michigan. "Yet we're seeing a full-frontal assault on just all aspects of immigration." For American businesses, it has a bottom-line impact. Link Wilson, an architect who co-founded a firm in Bloomington, Minnesota, said finding enough qualified workers within the U.S. has been a problem for years, in part due to a shortage of architects. He said employers who turn to international applicants do so as a last resort, putting up with legal fees and ever-expanding visa approval times because they have no other choice. "We're just at the point where there's no one else to hire," said Wilson, who estimates his firm turned away about $1 million in projects last year because it didn't have enough staff to handle them. Three months after taking office, Trump issued his "Buy American and Hire American" executive order, calling for H-1B changes to promote the hiring of Americans for jobs that might otherwise go to immigrants. Subsequent memos have allowed for greater discretion in denying applications without first requesting additional information from an applicant, tossed the deference given to people seeking to renew their H-1Bs, and raised concern that the government would revoke work permits for the spouses of H-1B holders. One order restricted companies' ability to use H-1B workers off-site at a customer's place of business, while another temporarily rescinded the option of paying for faster application processing. Attorneys who handle these applications say one of the biggest shifts is an increase in "requests for evidence," or RFEs, from U.S. Citizenship and Immigration Services. An RFE can delay a visa for months or longer as applicants and employers are forced to submit additional documentation over things such as the applicability of a college degree to a prospective job or whether the wage being offered is appropriate. If the responses are unsatisfactory, a visa may be denied. "They're just blocking the avenues so that employers will get frustrated and they won't employ foreign nationals," said Dakshini Sen, an immigration lawyer in Houston whose caseload is mostly H-1B applications. "We have to write and write and write and explain and explain and explain each and every point." Jessica Collins, a spokeswoman for USCIS, linked the changes to the president's executive order, saying the goal was to reduce "frivolous" petitions and that "it is incumbent upon the petitioner, not the government" to prove eligibility. Trump has vacillated between criticizing H-1Bs as "substituting for American workers at lower pay" to expressing support, as he did last month, when he said he wanted to "encourage talented and highly skilled people to pursue career options in the U.S."
Caught in the crosshairs are workers like Leo Wang. Wang, 32, got into the University of Southern California, interned at a major venture capital firm and wasted no time after finishing his master's before starting on another degree. His dream of a six-figure Silicon Valley job came true but disappeared quickly. Wang was working at Seagate Technology under an immigration provision known as Optional Practical Training, which gives those on student visas permission to work. But that expired last year, and because his H-1B application was in flux, he was forced to take a leave from Seagate and withdraw from the master's program he was pursuing at Berkeley. He says he and his company dutifully responded to an RFE, compiling examples of his work at Seagate. But on Jan. 11, Wang got a final answer: He was denied an H-1B. This month, he returned to his native China. "I still believe in the American dream," he says. "It's just that I personally have to pursue it somewhere else."